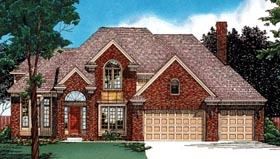 The classical details, decorative windows and dignified brick exterior of this home create sophisticated curb appeal. The volume living room and formal dining room reflects total elegance with a large bayed window. The sensible kitchen provides a large pantry, two lazy Susans and a large center work island. The dinette and kitchen provide for prime family living. The elevated den is accessed through the double doors off the staircase landing. The distinctive master suite is highlighted by a built-in dresser, extra-large walk-in closet and luxurious bath with an arched opening to the whirlpool and shower area. Three additional bedrooms share the full bath in the hall.